Truffle hunts, foot traffic and biosecurity. For our truffiere, besides insect pests, there are other fungi that also like to form symbiotic relationships with trees. ECM (ectomycorhizal) fungi compete with truffles for space on the new root tips, and in some cases can totally displace truffle from a tree. Some of our trees were contaminated with these fungi before delivery, with fairy rings of mushrooms growing out from the trees since early years. This affects around 15% of trees in our truffiere and it is likely we will need to remove and destroy many of the affected trees. Here the tree in the foreground has no signs of truffle at all, but is entirely circled with ECM fungi spreading outwards. Near the dogs is an actively producing tree, with a nice truffle brule around it, the roots from the infected tree will soon reach the brule with unknown consequences. Current insects that attack near surface truffles ( less than 1” deep) are; snails, slugs, centipedes, slaters (especially the hard shelled “butchy boys”), springtails (1mm grey bug) and finally the occasional mushroom fly (fungus gnat). Management of these is limited to controlling the physical environment, such as reducing leaf litter, and locating at risk truffle early enough to cover with extra soil. We don’t believe chemical controls are acceptable with such a deliciate symbiosis between truffle and tree, nor for a gourmet product. The last thing we need is additional insects or fungi. We now provide gumboots for the few times a year guests visit the truffiere. This an improvement on the previous use of footbaths which was time consuming, and less effective than farm provided boots. If you do visit a farm elsewhere, ensure you have no soil on your boots, and use footbaths when asked. There are various other insects and fungi known to cause problems elsewhere in Australian truffiéres, so each area has its own problems, and we all need to do our best to keep our problems local. Here a large truffle has been stepped upon, or hit by a wheel during Autumn slashing in 2014. 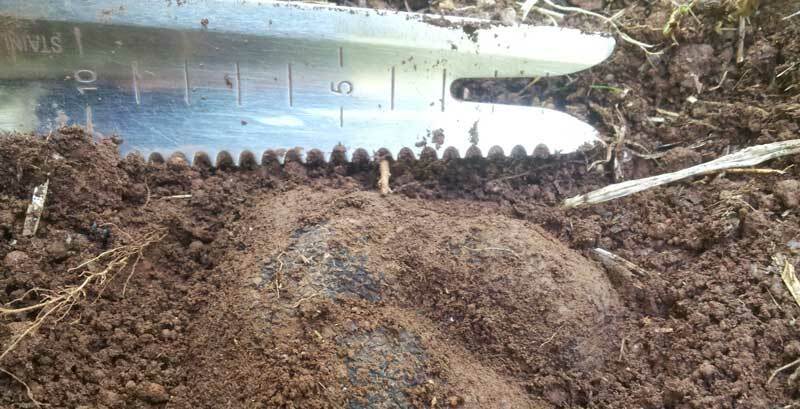 It was a surface truffle, ~300grams, substantially exposed to risk from feet and insects, the pressure cracked it open, exposing the interior and it then rotted. This happened despite best efforts to keep our traffic away from high risk regions around known producing trees. This truffle was on a new tree and an unexpected 150 cm from the tree, which is unusual as first truffles generally appear next to the trunk. Please follow any requests of truffle, wine growers etc. regarding footwear and other precautions, and only walk where instructed while on farm, this partially reduces the risks to the grower. Utilise any provided disinfectant baths both entering and exiting the property. The other day Bear choked on a piece of meat, I found him only a minute or two later, unconscious, unbreathing. Fortunately I managed to remove the piece of meat, and get him breathing again. I wished I had read something about first aid for dogs, as I was missing some basic ideas on how to proceed. The only dog related health check I knew was pressing the gum, and colour should return in 2 seconds, indicating healthy heart/oxygen supply. Despite having done human first aid training, I was at a loss as to the best way to go about it for a dog, and no idea how to even tell if he had a pulse, let alone mouth to nose, or CPR. I would have felt more confident had I known the information linked below, and had I not fortunately met with success, I would have been able to persist for longer with proper method assured it was the correct thing to do. Why is truffle so cheap?